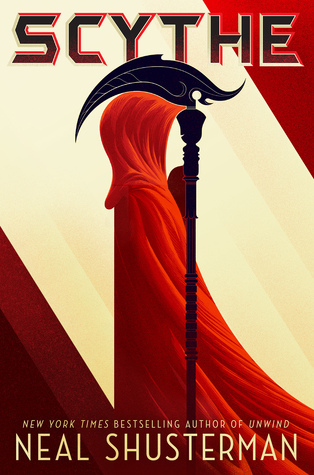 Scythe by Neal Shusterman. Simon & Schuster Books for Young Readers, 2016. Hardcover. 433 pages. Oh man, this book. I don't even know where to start talking about the crazy, incredible content of this book. If, like me, you have been hearing amazing things about Scythe, then I just want you to know that every word of praise is absolutely deserved. Neal Shusterman is truly a genius and I am always immensely impressed with his books. The ideas that he plays with and the moral quandaries that are debated in this book are insane and wonderful. I can easily say that this is one of the most thought-provoking books that I have read this year. The most prominent theme and subject that Scythe deals with is, of course, death. But this isn't done in an overly morbid way. Don't get me wrong, the subject itself is inherently morbid and dark, but this book doesn't treat is as such - necessarily. It's more along the lines of questioning what death means, and also what immortality means, endless aging. Would you want to live forever, or is there a point in which you wouldn't want to keep living, even if you could continuously reset your body to younger ages? Would you want to live in a world knowing that you or anyone around you could be randomly chosen and gleaned (aka: killed) at any time? But then, how is that any different from random deaths from accidents and disease that occur around us everyday, anyway? Or would you want to become a scythe in order to ensure you and your family's immunity from death, when you would then have to be the bringers of death to millions. There are honestly just too many questions to ponder, and the way in which Shusterman brings these topics into the story are incredibly fluid and momentous. One aspect of the world created in Scythe was the notion that society had reached an area where every urge and necessity is met. If we are guaranteed food, shelter, the basic necessities of life, will we have any motivation to continue doing things and making advancements. Are there any advancements to work towards? Or is it more likely that life will become routine and monotonous with such a lack of motivation? I mean, death itself is even eradicated. People can be revived after be rendered 'deadish' (essentially, one dies, but not permanently because they can just be taken to a 'revival center' and be brought back to life, good as new in a few days), so where is the motivation in this world? I think all of these observations and topics are timely considering the many advancement we have made, and it is interesting to take a look through Shusterman's world that displays both the numerous benefits and consequences that arise. There is also no "good" and "bad" in this book. Even the 'villainous' characters have legitimate arguments and thought processes. This book makes you question everything. It makes you realize that even institutions and advancements created with the most good-willed, positive intentions are susceptible to horrible corruption. Moving away from the bigger themes of this book, I want to briefly discuss the two main characters, Citra and Rowan. I really enjoyed getting to know both of these characters and experiencing the many changes and feelings that they both experienced. As much as I would like to go into more detail regarding their character development, I am going to refrain from doing so, solely because it will give away some important plot elements that I really do not want to spoil. All I can say is that Shusterman really took some time in crafting his characters and determining how they would react to various environments, which made this an even more fascinating read in regards to the psychology of being taught to kill. Shusterman has an incredibly accessible writing style that is both mature and simple at the same time. It is easy to follow along with his writing, and I can imagine a wide variety of people enjoying his style. The premise of Scythe may be heavy, but Shusterman incorporates humor in a meaningful way that adds so much enjoyment to the story. Most of his characters are full of wit and sass, so if you are drawn to that, then you will definitely like these characters. I want so much more from this world, but I'm also fearful of what could happen in this world. Where does the corruption end, or will it? It's not really fathomable to imagine that corruption can be permanently ended. It will always sneak its way back in, and I think that that is the beauty of this book. Where do things end, if not even death can bring an end to things? Overall, I am giving Scythe five stars - and I'll be adding it to my favorites! I'm really looking forward to reading this one! It sounds amazing. I love books that manage to bring deep questions to play without completely devolving into lectures and preaching.